Hurricane Michael made landfall as an unprecedented high-end Category 4 Hurricane for the Florida Panhandle region on October 10, 2018. The storm caused catastrophic damage from wind and storm surge. The storm wrought widespread catastrophic damage as it spread well inland and into southwest Georgia. The communities hit by this storm will be rebuilding and recovering for years to come. In Fiscal Year 2018, staff from across the National Ocean Service supported the impacted communities by delivering coastal science, management, and operational expertise. Following is a summary of some of those activities. The National Geodetic Survey (NGS) collected damage-assessment imagery of areas affected by Hurricane Michael using information from NOAA, the Federal Emergency Management Agency, and other state and federal interests. Imagery was processed and posted online within approximately four hours of the flights, and may be viewed online via the NGS aerial imagery viewer. NGS began response efforts on October 11, one day after landfall. NOAA’s King Air aircraft, operating from Mobile, Alabama, collected 9,580 images covering 4,153 square miles of the most heavily affected areas. The imagery assessed coastal impacts to navigation and identified landing zones for helicopters to deliver supplies to areas cut off by the storm. The U.S. Coast Guard's incident command post also used the imagery to coordinate response efforts. Data is available covering inland areas between Florida’s State Road 20 and Interstate 10; areas north of Interstate 10 and west of Lake Seminole; coastal areas west of Panama City, Florida; and inland areas near Apalachicola, Florida. A blog entry from the Office of Coast Survey (OCS) noted that NOAA’s western Gulf Coast navigation manager, embedded with the Maritime Transportation System Recovery Unit (MTSRU) in Mobile, Alabama, to engage with U.S. Army Corps of Engineers (USACE) and the U.S. Coast Guard (USCG) on storm preparations and coordination of NOAA’s Navigation Response Teams (NRT). Once the storm passed through the Florida panhandle, NRT-Stennis and NRT Fernandina Beach, Florida, collectively surveyed areas in Pensacola and Panama City, Florida, at the request of USACE and USCG MTSRU. The team also searched for the USS Sea Fighter’s two anchors as well as three range towers for the USCG. In addition to surveying, NRT-Fernandina Beach investigated a tide gauge for NOAA’s Center for Operational Oceanographic Productions in Panama City, Florida. The data collected with these surveys complemented the USACE single beam survey efforts in federally maintained channels and surrounding areas. OCS compiled a list of potential dangers to navigation and worked with the USCG, USACE, and port partners to ensure these items were either salvaged or submitted to OCS as Dangers to Navigation, and then distributed to mariners via weekly electronic navigation chart updates. The Office of Response and Restoration (OR&R) reviewed imagery from Hurricane Michael, taken by NOAA's National Geodetic Survey (NGS), to identify potential pollution sources such as displaced vessels and containers. Michael's extreme winds and storm surge caused widespread damage, and there were many reports of displaced, overturned, and capsized vessels. The imagery was ingested into OR&R’s Environmental Response Management Application (ERMA®). NOAA and the U.S. Environmental Protection Agency have identified regulated facilities, including commercial and industrial facilities and Superfund sites, that lie in the affected zones. NOAA’s Gulf of Mexico Disaster Response Center in Mobile, Alabama, provided office space and support to the U.S. Coast Guard and NGS. All OR&R staff working in the areas impacted by Michael were accounted for. The U.S. 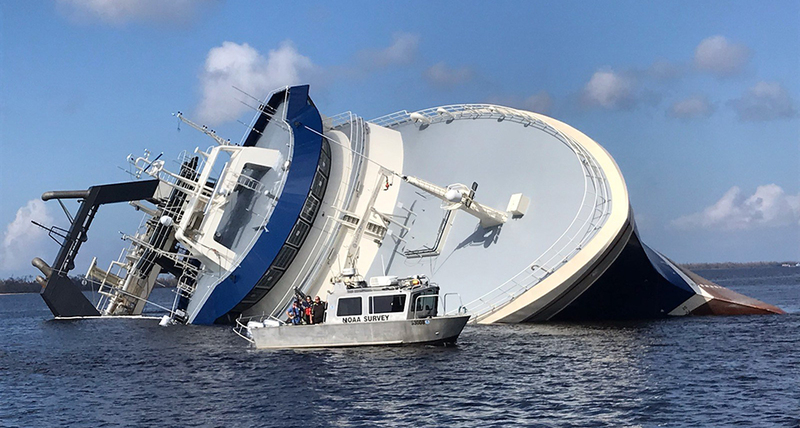 Integrated Ocean Observing System (IOOS®) worked closely with its Gulf of Mexico and southeastern U.S. regional associations (GCOOS and SECOORA, respectively) to monitor Hurricane Michael’s aftermath and assist in response. In-situ observing equipment included high-frequency radars, buoys, and gliders, which functioned as expected throughout the storm. All gliders continued to transmit data to the IOOS Glider DAC Map throughout the storm, which passed within 50 kilometers of U.S. Navy glider NG288. Data and information for Michael can be found on SECOORA's Michael Dashboard, and general hurricane resources are available on the IOOS Hurricane Season Resources page. The Office for Coastal Management (OCM) reported no impacts to operations following Hurricane Michael, and all staff were accounted for. Partners at Florida’s Apalachicola National Estuarine Research Reserve reported some damages to facilities. State staff in Florida assessed damages to the reserve and nearby aquatic preserves, and were involved in site cleanup and facilities damage assessment. OCM also helped the Office of Response and Restoration’s disaster response team locate derelict vessels. Digital Coast resources were shared with state partners before and after the storm, and office staff and liaisons assisted with communication plans. OCM continued to share relevant information as it became available, and assessed and support partners’ operational needs.